D. Ioannis Chrysostomi Episcopi Constantinopolitani in sanctu Iesu Christi Evangelium secundum Joannem comenarii, diligenter ab Arrianorum faecibus purgati, & in lucem in sacrae paginate tyronum gratiam modò recens sub minori forma aediti. Joan IIII. [with]: . . . Marcum & Lucam. by CRISOSTOMO, Juan, Santo [Chrysostom, John] (ca. 344-407). Paris:: Apud Mathurinum Dupuys. . . Sylvestris & Frobenii, 1547., 1547. Two parts in one. Small 8vo. 283, , 79 ff. Woodcut initial letters, printed marginalia, index. Original full historiated pigskin with brass clasps, manuscript spine title. Stamp on title: Ad Biblioth[eque]. Conv. Franc., with related manuscript inscription at head of title. AS IS: heavily wormed throughout. Very rare (no copies located). Part of the commentaries, or homilies, on the Bible, this part being the Book of John, the fourth Gospel, and including, in the second part, the Books of Mark and Luke. 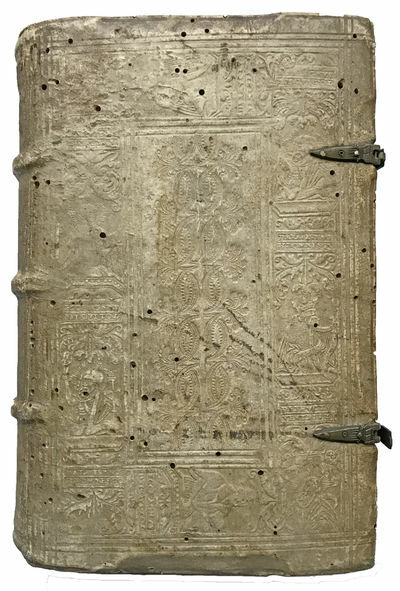 Another part printed separately (not present here), contains commentaries on the book of Matthew [pagination , 276ff.]. John Chrysostom, c. 349 - 407, Archbishop of Constantinople, was also a prolific writer and his homilies are well known. "Chrysostom's extant homiletical works are vast, including many hundreds of exegetical homilies on both the New Testament (especially the works of Saint Paul) and the Old Testament (particularly on Genesis). Among his extant exegetical works are sixty-seven homilies on Genesis, fifty-nine on the Psalms, ninety on the Gospel of Matthew, eighty-eight on the Gospel of John, and fifty-five on the Acts of the Apostles." - Wikip. & Catholic Encyclopaedia.